Editor’s note: If you missed Part 1 of this webinar series, we will email you a link to the archived recording after you register for Part 2. Part 3 will conclude the series next week! Moving to the Cloud is a game changer for your business! Reducing IT expenditures, allowing you to shift the focus from IT to billable work hours and giving you the convenience of Anytime, Anywhere access. Cloud9 Real Time offers customized Cloud solutions for businesses to host all your applications, data and users in one central Virtual Office Solution. Cloud9 Real Time is an Accredited Managed Service Provider delivering dynamic Cloud Solutions for Anytime, Anywhere access. Licensed by both Intuit and Sage for Commercial Hosting and offering a customized, privately labeled all-in-one virtual office solution. Voted best Hosting company for 2012 by the CPA Practice Advisor, Cloud9 Real Time provides clients a secure and private cloud solution. On the forefront of cloud computing, giving users access to their Applications, Data and Exchange services in one central location, Cloud9 Real Time offers QuickBooks hosting as well as custom virtual server creation. Never charging for storage, IT or maintenance, get your business on Cloud9 today! 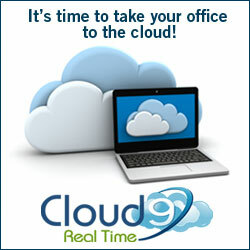 Visit us at www.cloud9realtime.com to learn more. Robert is the President of Cloud9 Real Time, an accredited Managed Service Provider and licensed Intuit Commercial Host. Focusing on business development and education of Cloud Computing advancements, Robert is a regular speaker and commentator for Accounting shows across the country. Combining his knowledge of business administration with experience in the field, he helps accounting professionals and Business executives streamline their business while reducing expenditures. David is the President and CEO of SurePrep and has been recognized as CPA Practice Advisor‘s Top 40 Under 40 for the last four years running and has been selected as Accounting Today’s Top 100 Most Influential People three times. Mr. Wyle was a CPA with the accounting firm Coopers & Lybrand. Mr. Wyle earned a BA degree in Economics from the University of California at Santa Barbara in 1994.